Now Axelrod tells us that throughout Obama's first term, he "had been pulling his punches with Israeli Prime Minister Benjamin Netanyahu for fear of antagonizing some elements of the American Jewish community." Pulling his punches? Seriously?! Was Obama pulling his punches in March 2010 when he walked out of a White House meeting and refused to have his picture taken with Prime Minister Netanyahu? Was he pulling his punches in May 2011 when he delivered a speech demanding Israel return to its pre-1967 "Auschwitz borders"? Was Obama pulling his punches in September 2012 when he refused to meet with Netanyahu in New York during a U.N. conference? But since Obama has been reelected, Axelrod told CNN's Jake Tapper this week that he believes Obama "feels very much unrestrained." Now a "fully unrestrained" Obama is "begging" Iran for a nuclear deal that would allow the mullahs to become a "threshold" nuclear power and a deadly threat to Israel. In previous reports, we have mentioned Denver teenagers and Muslims from Minnesota who have tried to leave America and wage jihad with ISIS overseas. U.S. intelligence agencies estimate that as many as 150 Americans have or have attempted to travel to Syria to fight with ISIS. What do we know about these people? How well are we tracking them? How many have returned to the U.S.? That issue came up during a hearing this week on Capitol Hill featuring testimony from Michael Steinbach, a top official in the FBI's Counterterrorism Division. "We don't have it under control. . . . If I were to say that we had it under control, I would say that I knew of every single individual traveling. I don't, and I don't know every person there, and I don't know of everyone coming back. So it's not even close to being under control. "Former Republican Congressman Frank R. Wolf and his new group, 21st Century Wilberforce Initiative, has just issued a disturbing report entitled "Edge of Extinction." Its message: If ISIS is not defeated, Christians and other religious and ethnic minorities face a genocide. The report comes after a fact-finding mission to Iraq by the Wilberforce delegation, including Wolf, Wilberforce President Randel Everett and my daughter Elyse, who is a key member of the new group's staff. While collecting information on the carnage, the delegation came within 1.5 miles of the ISIS frontlines. They interviewed dozens of displaced Christians and other religious minorities. Among their findings is that Iraq's Christian population, once 1.5 million, has been reduced to a remnant of just 300,000 without homes, jobs or churches. The full report can be accessed at 21wilberforce.org. I urge you to download the report and share it with your church leaders. The 21st Century Wilberforce Initiative is a welcome new force in the fight for religious liberty around the world. Tags: Gary Bauer, Campaign for Working Families, President Obama, unrestrained against, Israel, ISIS in America, ISIS in Iraq, Christians, other religious minorities, 21wilberforce.org To share or post to your site, click on "Post Link". Please mention / link to the ARRA News Service. and "Like" Facebook Page - Thanks! Paul Jacob, Contributing Author: The other day, when discussing Dodd-Frank's ill effects on the financial system, I detected a pattern. Politicians had identified the crash of 2007-2009 and "did something." They rushed to reform the financial regulatory system in accord with their preconceived notions. Since then the financial system has become more concentrated, with community banks dropping off like flies. The pols say they are defenders of the downtrodden, but they simply played into the hands of the "fat cats." It's the way of ham-handed interventionism. Every fix puts us in a bigger fix, so to speak, as "unintended consequences" multiply in the negative. 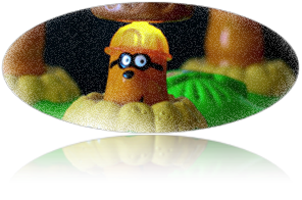 It's like Whac-A-Mole, the arcade game: a mole pokes its head out of a hole. You hit it with a mallet. And then another mole pops up out of another hole. And you hit it. And you keep doing this, faster and faster, gaining points. It's sort of like economic policy. The voters see you hit something. Ding! But more moles pop up. In real life, it's more like Hydra Whac-A-Mole. Bop one mole, out come two; bop another, up pop three. And it's not just five holes on the board. It's an infinity. Interventionists cause more problems than they solve. Try to "solve" poverty by taking from the rich and giving to the poor? Soon, there's not as much money in rich pockets to invest, and there are less jobs: the poor become trapped; they cease to improve themselves for work; their children lack role models; etc., etc., etc. Or, as they might as well say in the halls of Capitol Hill: Hail, Hydra. Tags: Paul Jacob, Common Sense, Whac-a-molenomics, Hydra, Whac-A-Mole, interventionism, interventionists To share or post to your site, click on "Post Link". Please mention / link to the ARRA News Service. and "Like" Facebook Page - Thanks! "To the extent any funds, including any monies raised by fees assessed by USCIS, are being used to implement the plans to extend DACA and establish DAPA, whether the use of such funds is unauthorized or prohibited. "Whether USCIS is using property or employees designated for a specific purpose to implement the plans to extend DACA and establish DAPA, regardless of such designation. "The legal issues involving the improper use of taxpayer dollars are urgent given that the USCIS may have already entered into or imminently will enter into contracts and/or do so. This unauthorized spending may be a direct violation of the Antideficiency Act, which makes it a violation of law, with potential civil and criminal penalties, for government officials to spend monies that have not been appropriated by Congress. President Obama's nullification of immigration law is broad and involves numerous policies in multiple federal agencies, but the center of the storm is in USCIS, where monies are being misspent in ways contrary to the fundamental purpose of that law enforcement agency. "Our legal team reports that the Antideficiency Act generally prohibits an officer or employee of the U.S. government from:[M]aking or authorizing an expenditure from, or creating or authorizing an obligation under, any appropriation or fund in excess of the amount available in the appropriation or fund unless authorized by law; involving the government in any obligation to pay money before funds have been appropriated for that purpose, unless otherwise allowed by law; accepting voluntary services for the United States, or employing personal services not authorized by law, except in cases of emergency involving the safety of human life or the protection of property; making obligations or expenditures in excess of an apportionment or reapportionment, or in excess of the amount permitted by agency regulations.To the extent an officer or employee may be in violation of the Antideficiency Act, Congress mandates that the Comptroller General, the head of GAO, conduct an investigation of the matter. The Obama gang was most recently found to have violated this law by the GAO in the scandalous release of terrorists in the Bergdahl swap scandal. "[S]hall be subject to appropriate administrative discipline including, when circumstances warrant, suspension from duty without pay or removal from office." In addition, an officer or employee who "knowingly and willfully" violates [the law] "shall be fined not more than $5,000, imprisoned for not more than 2 years, or both. "Some in the U.S. Senate seem to understand the legal stakes. Sen. Jeff Sessions (R-AL) joined with Judiciary Committee Chairman Chuck Grassley (R-IA) and Homeland Security Chairman Ron Johnson (R-WI.) to write a letter addressed to Joseph Moore, Chief Financial Officer for the USCIS, that asks for highly pertinent financial information. The letter correctly points out that Obama's directives "will redirect scarce resources away" from the USCIS's "core mission" for activities Congress never approved. And, it makes the following, very pointed, request:To assist us in our constitutional oversight responsibilities, we are asking you, as Chief Financial Officer, to provide a detailed accounting of all expenditures by USCIS to date and a projection of all temporary and permanent expenditures for these executive actions, including the source of the funds to be used and the specific accounts in which the funds are located, in dollar amounts. Please also indicate the amount USCIS is projected to spend on these programs from FY2015 through FY2025 on a monthly and annual basis.Instead of doing the public's business to enforce immigration law, the USCIS has been hijacked by President Obama and his appointees to aid, abet, and harbor illegal aliens - in absolute violation of the law. Obviously, Congress never appropriated money for the lawlessness. The strict enforcement of the Antideficiency Act against this egregious misappropriation of government monies (your tax dollars) is one more "rule of law" tool that may help to bring the administration's illicit actions to a halt. Tom Fitton is president of Judicial Watch, which is representing several individuals and organizations in the ACLU subpoena litigation. Tags: Tom Fitton, Judicial Watch, President Obama, Amnesty, may be, Federal Crime, illegal aliens, illegals To share or post to your site, click on "Post Link". Please mention / link to the ARRA News Service. and "Like" Facebook Page - Thanks! by Newt Gingrich: Every member of Congress should vote NO on President Obama’s request for an “authorization for the use of military force” (AUMF) against the Islamic State of Iraq and Syria (ISIS). President Obama’s request is an absurd and insulting effort to get the Congress to provide political cover for a hopelessly unworkable campaign in Iraq and Syria. The proposal is absurd both because of the context within which it is being offered and because of the structure of the proposal itself. Let’s start with the recent context in which the President is asking for approval. His spokesman announced that the Taliban is not a terrorist group. This is a group the U.S. has been fighting since late 2001, when our invasion of Afghanistan to remove the Taliban from power marked the beginning of the War on Terror. For more than 13 years, we have been killing Taliban members and they have been killing Americans and Afghans. Now, thousands of lives, tens of thousands of wounded and billions of dollars later, the Obama White House says they are not terrorists. President Obama decided to use the National Prayer Breakfast as a venue to announce that his one-sided distortion of 1,000-year-old history proved we should not judge too harshly the terrorists who today behead and burn their victims to death. This was bad history, bad timing, ridiculously bad judgment. President Obama explained that the killing of Jews in a Jewish grocery store in Paris–by a radical Islamist who told the media he had set out to kill Jews–was a “random” act of violence. This is delusional on a clinical scale, or dishonesty on cynical level. The White House and State Department spokespersons backed up the President, of course, and looked idiotic doing it. In the same interview, the President said he thought the problem of terrorism was “hyped” by the media, and suggested that it gets relatively too much attention compared to more pressing threats like global warming. Back in October, President Obama declared Yemen a good example of how our policies were working. This week the radical Islamists defeated the government. The British, French and American embassies were evacuated and the rebels are now driving our vehicles around the capital. The leader of the National Counterterrorism Center admitted that we were surprised by the sudden collapse of the Yemeni government (just as we were surprised a few months ago by the sudden collapse of the Iraqi Army). Lt. General Michael Flynn, the immediate former head of the Defense Intelligence Agency, has said that things are getting worse and the radical Islamists are gaining strength. He has said bluntly that the current plans and strategies aren’t working. The director of the FBI said last week that there are active anti-terror investigations underway into individuals possibly connected with ISIS in 49 states. Under the Obama regime of political correctness, of course, the FBI director can’t tell us what common characteristic is shared by the threats in 49 states. If the President can’t even honestly and accurately describe our enemies, why would reasonable, prudent members of Congress vote to legitimize his policies? The entire context surrounding the administration’s request proves it is doomed to fail. But the authorization itself is also so weak that it deserves to be defeated for that reason alone. President Obama is proposing a three-year authorization. We have been struggling with radical Islamists since the Iranians seized the American Embassy in 1979. If we have not won in 35 years, why would we think President Obama can win the war with no name against the enemy with no identity in three years? The Obama resolution is profoundly wrong in its focus. Radical Islamists are a global problem. The most recent estimate is that more than 20,000 foreign fighters have flocked to Iraq and Syria to join ISIS. The United States has had at least 150 people trying to join the terrorists. Britain has had more than 600. The French more than 1,000. The emergence of radical Islamist groups continues across the planet. Any resolution which focuses only on Iraq and Syria is by definition a failure. In 2014 Boko Haram killed more people in Nigeria (10,000) than Ebola killed in all of Africa (8,000). The radicals are gaining ground in Yemen. Al Shabab remains a threat in Somalia. Libya continues to host terrorist factions. This is clearly a global campaign. A declaration of war against all elements of radical Islamism would make sense. I joined a group of House members in calling for such a declaration of war immediately after 9/11. Our reasoning then is still true today. Declaring war would turn aiding radical Islamists into an act of treason. It would define the campaign as a war, to be fought under the rules if war. It would end the efforts of lawyers to get judges on the battlefield. It would communicate to friends and enemies alike how serious we are about winning and not just trying. The Obama proposal is both factually and symbolically absurd and it should be rejected. Tags: Congress, Vote No, President Obama’s, Phony Non-War Resolution To share or post to your site, click on "Post Link". Please mention / link to the ARRA News Service. and "Like" Facebook Page - Thanks! 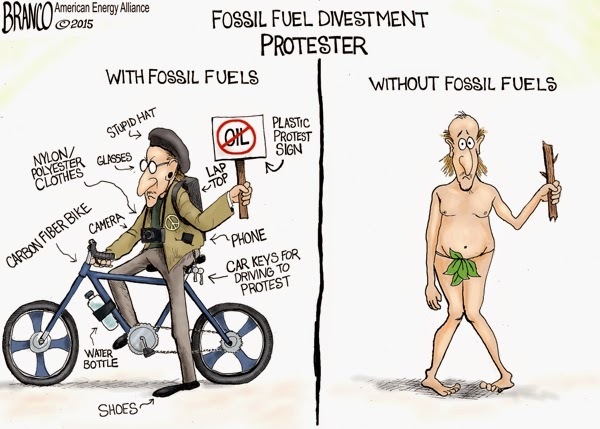 No Shoes, No Shirt . . .
. . . 'Divestment fossil fuels protester' has no clue just how important fossil fuels are to every day life in modern society. Travel, Food Supply, along with many life saving products etc. Tags: Editorial Cartoon, AF Branco, divestment protester, fossil fuels, travel, food supply, life saving products To share or post to your site, click on "Post Link". Please mention / link to the ARRA News Service. and "Like" Facebook Page - Thanks! By Maggie Ybarra - The Washington Times: Islamic State militants clad in Iraqi fighter uniforms and suicide vests launched a sophisticated attack Friday on the second-largest U.S. air base in Iraq, creating havoc at the site of a U.S.-led training operation. Defense Department spokesman Rear Adm. John Kirby said during a Friday briefing at the Pentagon that 20 to 25 militants — most of them wearing the uniforms of the U.S. partner nation — rushed the Ain al-Asad base near the western Iraq town of al-Baghdadi and were able to breach the base perimeter. Some of the militants detonated their suicide vests, though it is unknown how far into the base the militants were able to get before members of the Iraq army were able to quash the attack, Adm. Kirby told reporters. About 320 U.S. Marines have been training troops from the Iraqi 7th Division on how to combat the Islamic State at Ain al-Asad, Reuters reported. The attack is not the first to occur since training began. The base was struck by mortar fire at least once since December, Reuters reported. Tags: U.S. Air Base, Iraq, attack by, Islamic State, militants, The Washington Time, Fox News To share or post to your site, click on "Post Link". Please mention / link to the ARRA News Service. and "Like" Facebook Page - Thanks! by Rick Manning: The Obama Administration and their cohorts launched a double-barreled assault on the First Amendment this week. The Federal Communications Commission (FCC) dumped 330 pages of regulatory Super Glue on the operation of the Internet making clear their intention to turn the greatest source of democratized communication since Gutenberg invented the printing press into a public utility. Perhaps jealous of their speech regulator counterparts, the Federal Election Commission (FEC) held a hearing to begin the discussion of how they can regulate political speech on the Internet. Here’s a newsflash to the FEC — you cannot. The blogs, articles and political information sources that the Democrat appointees on the FEC find so abhorrent are no different than the newspapers, radio or television broadcasts that they have no control over the content placed on them. Political news and commentary websites, whether using a link-driven system like the DrudgeReport, a news-oriented one like Breitbart.com or HuffPo, or commentary-based blogs like -- ARRA News Service -- or NetRightDaily, provides First Amendment-protected information to people who a generation ago got their news from dailies and news anchors. It is this exact information expansion that drives the left crazy. While supporting the First Amendment when it applies to friendly news anchors and “all the news that’s fit to print” newspapers, the left sees talk radio and an open and free Internet as being a threat to their ability to appropriately shape the narrative. Yet, Internet bloggers are a much more accurate depiction of what the Founding Fathers were seeking to protect. In an environment where small towns had their own newspapers, and Patrick Henry self-published his seminal work, “Common Sense” that helped fuel the revolutionary fire, the men who wrote the Bill of Rights specifically were trying to prevent the government from determining what political speech was allowed. The current occupant of the White House has proven exactly why the Founders had this concern. Under Obama, the IRS has targeted conservatives and potential conservative donors. And then, not to be outdone, the Treasury proposed formalizing what the IRS had done with an enormous intrusion into the ability of non-profits to engage in political discourse. The to make certain approved topics were receiving enough coverage. The federal government staged an early morning raid of a Washington Times reporter’s house under a false guise, and in the process seized her notes that included the names of whistleblowers within the Transportation Security Administration. Fox News and New York Times reporters have been subjected to federal investigations and court proceedings simply because they were doing their jobs. Associated Press reporters had their phones bugged by the Justice Department in a government leak investigation. Senate Democrats even voted to neuter the First Amendment and replace it with language that would allow them to severely restrict speech, ending forever the illusion that they were defenders of the right to free speech, religion and protections for petitioning the government. As Congress looks at the net neutrality rules being proposed to turn the Internet into a public utility, and the FEC’s attack on political speech in the context of the rest of this Administration’s actions, it should change their view forever. This continuing assault on the First Amendment is not benign, it is an orchestrated attack on the most basic of all political rights, the right to dissent. Tags: President Obama, Obama administration, FCC, FEC, IRS, net neutrality, assault, freed speech, First Amendment, reporters, bloggers, news, articles, blogs, cartoons, editorial cartoon, William Warren To share or post to your site, click on "Post Link". Please mention / link to the ARRA News Service. and "Like" Facebook Page - Thanks! Congress Signs Keystone XL Jobs Bill; Majority of People To Obama: "Sign the Bill"
Mr. President: It's a No-brainer: SIGN the bill! This morning, House Speaker Boehner and Senate Majority Leader McConnell signed S. 1, the bill authorizing the construction of the Keystone XL pipeline. It was passed in the Senate and House. The bill is now ready to be sent to the president, who must then decide to sign it into law or veto it. The Senate is not in session today and will reconvene at 4:45 PM on Monday for a pro forma session. The Senate will return for legislative business on Monday, February 23rd. At 5:30 on the 23rd, the Senate will again vote on cloture on the motion to proceed to H.R. 240, the House-passed Homeland Security appropriations bill. Senate Democrats have prevented the Senate from taking up the bill three times now. Yesterday, Feb. 12, the Senate confirmed (95-5) Dr. Ashton Carter as the new Secretary of Defense. Carter will replace Secretary Chuck Hagel who took the post in 2013. Carter has a doctorate in in theoretical physics from Oxford University, where he was a Rhodes scholar, and served first as the Pentagon ’s chief of acquisitions and technology and later as deputy secretary during the Obama administration. The House reconvened at 9 AM today. This morning the House passed the America’s Small Business Tax Relief Act of 2015 H.R. 636 (272-142) — "To amend the Internal Revenue Code of 1986 to permanently extend increased expensing limitations, and for other purposes." 141 progressive liberal democrats voted not to provide relief to Small Business with regard to expenses they could claim for their business operations. The Speaker appointed made the following appointments House member to the following. - United States Group of the NATO Parliamentary Assembly: Mr. Turner, Mr. Johnson of OH, Mr. Miller of FL, Mr. Marino, Mr. Guthrie, Mr. Cook and Mr. Kinzinger of IL. - Board of Visitors to the United States Naval Academy: Mr. Young of IN and Mr. Rooney of FL. - Board of Visitors to the United States Coast Guard Academy: Mr. Smith of NE. - Board of Visitors to the United States Air Force Academy: Mr. Lamborn and Ms. McSally. - Board of Visitors to the United States Merchant Marine Academy: Mr. King of NY. The House adjourned at 12:23 PM today. The next meeting is scheduled for 2:00 p.m. for a pro-forma meeting on February 17, 2015. Per the Majority Leader's House calendar, the House will be their scheduled "District work week" until they return return on Feb. 24, 2015. Not votes are scheduled before 6:30 PM. Yesterday the House passed (279-137) H.R. 644 — The Fighting Hunger Incentive Act -"To amend the Internal Revenue Code of 1986 to permanently extend and expand the charitable deduction for contributions of food inventory." Amazingly, 136 so called bleeding heart (really hard hearted) liberals who say they are concerned about the poor and hungry voted AGAINST this bill. CNN reports today, “At a ceremonial ‘signing’ of a bill approving the Keystone XL pipeline House Speaker John Boehner's message to President Barack Obama was ‘do the right thing’ and enact the measure into law. “Boehner knows the President has already and repeatedly pledged to veto the bill. But the photo op at the U.S. Capitol of the Speaker prepping the bill to go to the White House on Friday morning, surrounded by GOP lawmakers and the head of the builders union that would construct the pipeline, was all about sending a political message. “‘The new majority is getting Congress back to work for the American people,’ said Senate Majority Leader Mitch McConnell, R-Kentucky. Indeed, the president is the main obstacle to finally beginning work on this pipeline and putting many Americans to work. Politico adds, ‘It’s really pretty simple: The Keystone XL pipeline is a good idea for our economy and for our country,’ Boehner said. ‘To the president I would just say this: Do the right thing. Sign this bill and help us create more jobs in America and create a healthier economy.’ ‘We’re hoping common sense will prevail here and the president will sign this extraordinary jobs bill,’ McConnell added. . . .
As Leader McConnell said earlier this week, “The Keystone Jobs bill is just common sense. That’s why this bipartisan legislation already passed the Senate with support from both parties. That’s why labor unions support it. ... American people support it. The Obama administration has delayed the Keystone XL pipeline for years. It has been studied and restudied. It will create jobs, help the economy, improve American infrastructure, enhance North American energy security, heal a sore point in relations with our friends in Canada, and it won’t cost taxpayers anything. The Keystone XL Pipeline project is a no-brainer. All that is needed is President Obama’s signature. Tags: Keystone XL Pipeline, no brainier, President Obama, sign the bill, House, small business, tax relief, To share or post to your site, click on "Post Link". Please mention / link to the ARRA News Service. and "Like" Facebook Page - Thanks! by Eric Odem: Several days ago we reported that a 4-Star General is saying the Muslim Brotherhood has infiltrated all levels of Federal Government, including senior level positions. Muslim Brotherhood is, without question, a terrorist organization and it’s shocking enough to learn they met with State Department officials. But it gets worse now that a member of the Muslim Brotherhood is saying a White House official also attended the meeting. Via Free Beacon.A Muslim Brotherhood member who recently was hosted at the State Department along with several of the Islamist group’s key allies now claims that a White House official also was present in that meeting, according to recent remarks. While the State Department initially misled reporters about the meeting, it was eventually forced to admit that several Obama administration officials — including a deputy assistant secretary for democracy, human rights, and labor—and State Department officials met with the delegation. 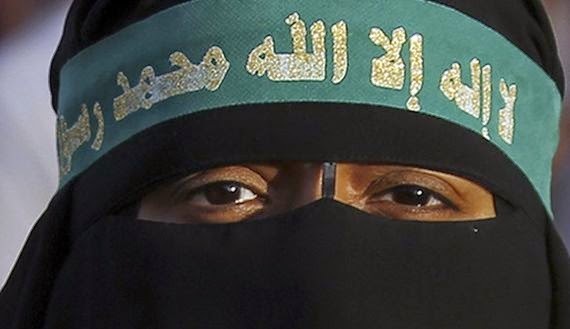 “The trip started for the [Egyptian] community in New York and New Jersey,” al-Dardery said in a recent interview with the Arabic language pro-Muslim Brotherhood El Sharq TV. “Then during the trip we undertook to meet with some from the ‘establishment,’ the administration, in the United States. And we met at the State Department and there was a representative there from the White House.”All of this happening while several Democrats in Congress are refusing to attend a joint session where Israel’s Prime Minister will speak. Israel = no meetings with White House. Muslim Brotherhood = Meetings with White House. Any more questions? Eric Odem (@ericjodom) is Managing Director of LibertyNews.com. Tags: Muslim Brotherhood, White House, official, Ste Department, Eric Odem, Liberty News To share or post to your site, click on "Post Link". Please mention / link to the ARRA News Service. and "Like" Facebook Page - Thanks! by Dr. Thomas Sowell: The current controversy over whether parents should be forced to have their children vaccinated for measles is one of the painful signs of our times. Measles was virtually wiped out in the United States, years ago. Why the resurgence of this disease now? 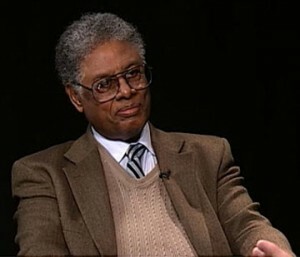 Tags: Thomas Sowell, commentary, Measles, Vaccines, Autism To share or post to your site, click on "Post Link". Please mention / link to the ARRA News Service. and "Like" Facebook Page - Thanks! by Alan Caruba, Contributing Author: I won’t be around to see it, but I have little doubt that future historians and others will conclude that President Barack Hussein Obama was the worst President ever to serve in that office. The reason is simple enough. His decisions on domestic and foreign affairs have already demonstrated his astonishing incompetence. His major contribution may in fact be to ensure that the voters elect conservatives in the next two or more elections to come. If he is remembered for anything it well may be the emergence of the Tea Party movement whose influence has been seen over the course of two midterm elections. One cannot help but think of such things as President’s Day, February 16, reminds us of Washington and Lincoln, both of whom were born during this month. For most it is just a day on which there are a variety of sales pegged to it. 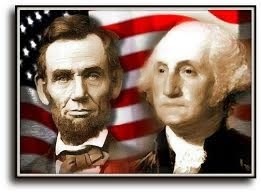 For all of us, however, it acknowledges the two Presidents without whom there would not be a United States of America. Presidents Washington, Lincoln and Franklin D. Roosevelt are routinely ranked at the top of the lists of those judged to have been of greatest service to the nation and, not incidentally, all three presided over wars that led to and maintained America’s sovereignty. Imagine a modern politician talking of religion and morality as the basis of political prosperity—least of all Obama who has disparaged Christianity and protects Islam. America was particularly blessed and fortunate in its earliest years to have a succession of men who demonstrated extraordinary intelligence, courage, and moral integrity. Following Washington there was John Adams, Thomas Jefferson, James Madison, James Monroe, and John Quincy Adams. Few nations have been so blessed as ours. One can only examine Lincoln’s life with a sense of wonder as he rose from humble beginnings to the role of keeping the Union intact in the face of the secession of southern states and the horrendous war that followed. Gen. Robert E. Lee surrendered on April 9, 1865 and on April 14 Lincoln was assassinated by an actor, John Wilkes Booth. His death was the occasion of the first American national funeral as cities and towns did their best to out-do one another to honor him. It took his death for people to realize the magnitude of what he had achieved. The advice Lincoln offered in his time is just as important, if not more so, in ours:You cannot help the poor by destroying the rich. You cannot help men permanently by doing for them, what they could and should do for themselves.Franklin D. Roosevelt and, earlier, Theodore Roosevelt, are also highly ranked among the Presidents. Both men shared a zest for the job, enjoying it. Teddy regretted announcing that he would not run for a third term (which he did with the Bull Moose Party) and FDR ran and won four times! He did so during the Great Depression and World War II. Two other families played a role in the presidency, the Adams and, in the modern era, George H.W. Bush was the 41st President and George W. Bush was the 43rd. It is popular to disparage both men, but history may come to another judgment. 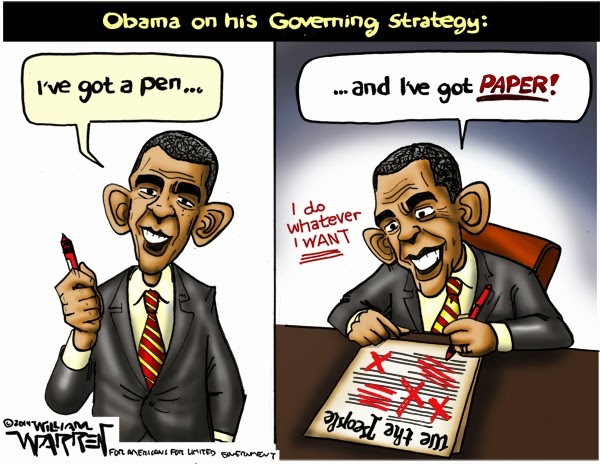 President Obama has brought nothing to the presidency except his Marxist theology. He was the least prepared in terms of experience in the workplace and his elections have been more about the manipulation of public opinion and his two terms have been an endless succession of lies. His signature legislation, ObamaCare, has undermined the nation’s healthcare system. His solution to the Great Recession added more debt in his six years in office than the combined debt of every previous President up to Clinton and did not stimulate the economy as promised. His ignorance of history and of current events is vast. Google "what does Obama know?" and you will find many articles that document this. He has been protected by a liberal mainstream media, but the voters have seen through that and have turned political power in Congress over to the Republican Party. One thing is for sure. On future President’s Days, Obama will barely be noticed when Americans look back on those who did much to address the great issues and challenges of their times. Tags: President Obama, Worst President Ever, President's Day, 2016, Alan Caruba, Warning Signs To share or post to your site, click on "Post Link". Please mention / link to the ARRA News Service. and "Like" Facebook Page - Thanks! by Kelsey Harkness, The Daily Signal: President Obama is calling on Congress to pass a three-year authorization of war against ISIS, also known as the Islamic State or ISIL. The draft request, formally called an Authorized Use of Military Force (AUMF), came almost six months after the president began launching attacks against ISIS—first in Iraq, then in Syria. The president’s proposal would allow airstrikes against the terrorist group or anyone supporting the militants but restrict the type of U.S. ground forces that could be deployed. “It’s not the authorization for another ground war like Afghanistan or Iraq,” Obama said today while speaking to press. James Phillips, senior research fellow in Middle Eastern affairs at The Heritage Foundation, said the president actually left himself “open to future use of special operations forces in an expanded role” beyond the missions in which they already are carrying out. It would also authorize the use of U.S. forces in situations where ground combat operations are not expected or intended, such as intelligence collection and sharing, missions to enable kinetic strikes, or the provision of operational planning and other forms of advice and assistance to partner forces.Phillips suggested the language used in the proposal could be an attempt by the president to gain support from Democrats in Congress who have voiced concerns over the open-ended nature of the war authorization. Meanwhile, Republicans in Congress continue to push back on the effort, arguing against placing any limitations on the time and scope of the fight against ISIS. “This [the three-year limit] could constrain the options of this administration and next. Unfortunately, ISIS will likely still be around in three years,” said Phillips. Tags: Guide, President's Authorization, use of Military Force, ISIS To share or post to your site, click on "Post Link". Please mention / link to the ARRA News Service. and "Like" Facebook Page - Thanks! by Bob Owens: U.S. District Court Judge Reed O’Connor has declared that a U.S. ban on the interstate sales of handguns by federal firearms dealers to buyers from other states violates the U.S. Constitution in a ruling in Mance vs. Holder issued Wednesday. The ruling by U.S. District Court Judge Reed O’Connor stemmed from a challenge to the ban brought by a Texas firearms dealer and a couple from the District of Columbia in July 2014. The federal law prohibits a dealer from transferring a handgun, but not a rifle or shotgun, to an individual who does not live in the state in which the dealer’s business is located. “While we expect the government to appeal, we are confident that the 5th U.S. Circuit Court of Appeals will agree with Judge O’Connor’s sound ruling,” attorney William Mateja, who represented the challengers, said in a statement.While the ruling is important, I wouldn’t count on running over to your neighboring state to purchase a handgun just yet. The judge may have made his ruling, but the government is certain to ask for a stay and then appeal the case, and there are not rules for how FFLs can legally conduct the sales at this time. Despite the fact that the ruling can’t be implemented immediately, it is still the latest in a string of important victories in Second Amendment cases in recent years. Judge O’Connor found that the federal ban violated both the Second and Fifth Amendments. The law only impedes the lawful transfer of handguns across state lines, and does not impact the illicit transfer of handguns used in crimes. The defeat of the ban was another slap in the face of outgoing anti-gun Attorney General Eric Holder who wholeheartedly supported the ban (and every other gun restriction). Once the case finishes winding its way through the court system—which could be several more years—the law may have the practical effect of making the handgun market slightly more competitive in pricing, but it is unlikely that it will have the effect of undermining those states with poltically-motivated approved handgun lists such as Massachusetts and California. Of particular long-term importance in Mance is that Judge O’Connor set the precedent of using the standard of strict scrutiny in his ruling. That is the most strict level of judicial review. O’Connor stated that the federal attorneys failed to establish a compelling government interest for the ban, and that the law was not narrowly tailored to achieve that goal. 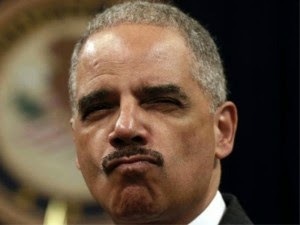 Tags: Attorney General, Eric Holder, defeated, District Judge, rules, Federal Interstate, Handgun transfer ban, unconstitutional, Bob Owens, 2nd Amendment, gun ownership, To share or post to your site, click on "Post Link". Please mention / link to the ARRA News Service. and "Like" Facebook Page - Thanks! 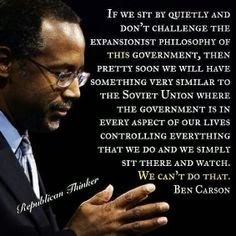 Dr. Carson is the very kind of person for whom SPLC was founded, or claims to have been founded. They originally wanted to Southerners who were black and poor and constantly being intimidated and harassed by the Ku Klux Klan. There’s no argument with defending those fellow Americans whose rights are being threatened by terrorists. Our organization, Family Research Council, knows what it’s like to be so targeted. We believe what Rev. Dr. Martin Luther King, Jr., believed, and what his great preacher father, Dr. Martin Luther King, Sr.—the famed “Daddy King”—believed. Namely, that everyone deserves a birth day, that brides should marry grooms, and that America is-- and should remain-- one nation under God with liberty and justice for all. Sharing those beliefs with others got us placed on SPLC’s “Hate Map” of Washington, D.C. And being placed on that Hate Map made us a target in 2012 for Floyd Lee Corkins, Jr. Corkins entered our office with a backpack full of Chick-fil-A sandwiches (day old), a pistol, and dozens of bullets. He was prepared to shoot us all because, as he confessed, SPLC’s Hate Map told him where he might find us. Corkins was stopped only by the heroism of Leo Johnson. Mr. Johnson, our director of security, was unarmed. Undaunted, he risked his life by grappling with the assailant. Corkins shot Mr. Johnson in the arm. Though grievously wounded, Leo Johnson nonetheless disarmed Corkins. No jury would have convicted him had he used Corkins’ weapon to end Corkins’ life. But Leo Johnson is a Christian. Leo Johnson is a black man. This is how far things have come. All over our country, Christians who protest the killing of unborn children, who defend marriage as the union of one man and one woman, and who uphold the liberty of conscience are being similarly targeted and called “haters.” If Leo Johnson had been a hater, he could have killed Floyd Lee Corkins with impunity. Dr. Carson is just the latest to feel the sting of their false and defamatory “hate” label. 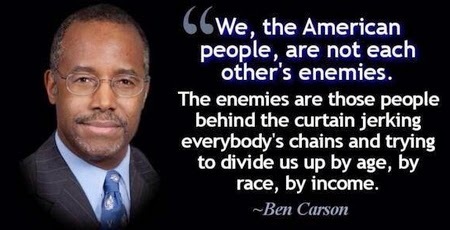 Consider this: Dr. Carson was born and raised on the mean streets of Detroit. His single mother made Ben and his little brother write weekly book reports. She couldn’t even read them, but she did everything she could to keep her boys out of the gangs. When Dr. Ben Carson became a world-famous brain surgeon, he once operated on conjoined twins in South Africa. Hours and hours into the dangerous and exhausting operation, he went outside the surgical theater for the briefest of breaks—and he prayed. He returned to the theater, successfully made the critical cut, and heard Handel’s “Hallelujah Chorus” over the operating theater’s music system! This is a story every American child should know. This is an example of God still sheds His Grace on us. This would even have been a great story for the President to tell at the national Prayer Breakfast. Now, we need to defend Christians — including minorities who seem to be especially targeted—who are threatened by SPLC’s propaganda. They have given Dr. Carson a reprieve, not a pardon. Their weak apology leaves open the door to another slanderous charge if he continues to speak the truth. Even if he speaks it in love. 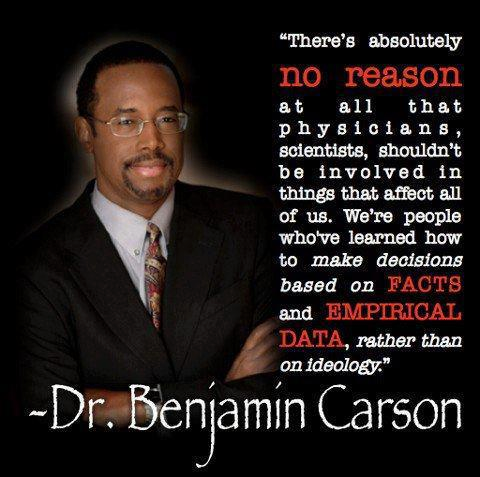 We stand with Dr. Ben Carson when he stands for Christian truth. And, in the words of a marching song SPLC ought to remember: We shall not be moved. Tags: Ken Blackwell, Bob Morrison, Southern Poverty Law Center, SPLC, smears, Dr. Ben Carson, Ben Carson, defend Christians, Family Research Council To share or post to your site, click on "Post Link". Please mention / link to the ARRA News Service. and "Like" Facebook Page - Thanks! Snow Job . . .
. . . Boston Snow Storm brings with it the context of Obama’s view that Global Warming is a bigger threat than Islamic Terrorism. 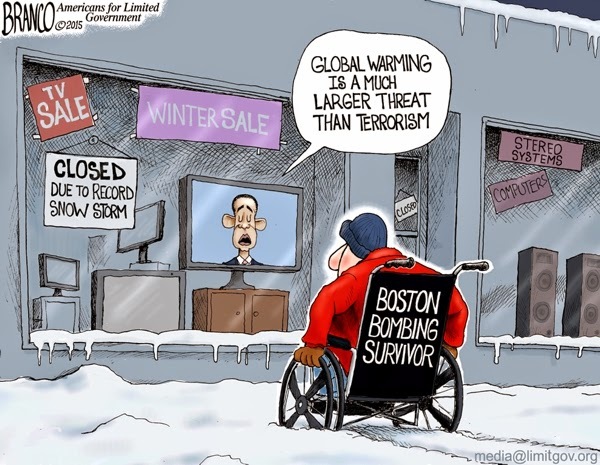 Tags: Editorial Cartoon, AF Branco, Snow Job, Boston Snow Storm, Obama's view. Global Warming. Islamic Terrorism To share or post to your site, click on "Post Link". Please mention / link to the ARRA News Service. and "Like" Facebook Page - Thanks! Dr. Bill Smith, Editor, ARRA News Service support this effort and has also signed the petition to "Protect Internet Freedom. Please join the effort by signing the petion at one of the following links and also watch the below videos. Protect Internet Freedom : Big government can’t seem to keep its hands off of anything. The latest insult: President Obama and the Federal Communications Commission are going to take over the Internet on February 26th if we don’t do everything we can do to stop them right now. A plan deceivingly referred to as “Net Neutrality,” involves declaring the Internet a “public utility” and gives the FCC the power to decide what Internet service providers can charge and how they operate. This is not only a direct attack on the free market, but it will also result in an increase in Internet access fees for millions of consumers in America. It’s a massive tax on the middle class, plain and simple. The details are complicated but here’s the truth: If "Net Neutrality" is passed, for the first time ever, the Internet will be under the rule of an antiquated regulation designed for land line telephones. President Obama wants to take something that’s working just fine, and tie it up in red tape--sound familiar? We've seen this movie before--it's called ObamaCare. The FCC plans to vote on Feb. 26th on whether or not the government should take their usual heavy handed approach to controlling the Internet or do the right thing and leave it alone. Tell President Obama and the FCC: "Don't mess with the Internet!" An unregulated Internet has been the single greatest catalyst in history for individual liberty and free markets on the planet. It has created the greatest revolution since Henry Ford invented the Model T.
Let's get this straight--technology has progressed because it has been driven by a free and open Internet--not because of DC bureaucrats. This latest attempt to regulate the web threatens to interrupt that positive innovation, set the market back, and kill jobs. A free, flourishing Internet is as important as anything man has ever created. But those freedoms are under assault. These attempts to regulate the Internet are a direct attack on the freedom of information and an innovative market. The government needs to stay out of the way. Free markets are worth protecting. Please tell your friends, your families, that there’s nothing neutral about net neutrality. We have to stop this aggressive, invasive, and harmful regulation and we need all the help we can get to do it. Tags: Porwct Internet Freedom, Internet, Internet Freedom, Obama administration, FCC, To share or post to your site, click on "Post Link". Please mention / link to the ARRA News Service. and "Like" Facebook Page - Thanks! The Senate reconvened on at 9:30 AM today. The Senate began consideration of the nomination of Ashton Carter to be Secretary of Defense. At 2 PM, the Senate begins to vote on confirmation of the Carter nomination. H.R. 644 - "To amend the Internal Revenue Code of 1986 to permanently extend and expand the charitable deduction for contributions of food inventory." H.R. 636 - "To amend the Internal Revenue Code of 1986 to permanently extend increased expensing limitations, and for other purposes." H.R. 431 (420-0) — "To award a Congressional Gold Medal to the Foot Soldiers who participated in Bloody Sunday, Turnaround Tuesday, or the final Selma to Montgomery Voting Rights March in March of 1965, which served as a catalyst for the Voting Rights Act of 1965." S. 1 (270-152) — "To approve the Senate's Keystone XL Pipeline bill." 29 Democrats joined 241 Republicans to pass the bill. 151 Democrats led by Nancy Pelosi and 1 Republican voted to oppose the jobs and progress on the Keystone XL Pipeline and support the President's opposition to approval of Keystone XL Pipeline. The Daily Caller noted, "Michigan Rep. Justin Amash was the sole Republican in the House to vote against the latest version of the bill advancing the Keystone XL Pipeline. Amash says he supports the construction of the pipeline, but he opposes legislation singling out one company. He has previously voted present on Keystone, but the addition of “new, unrelated sections empowering the EPA and the federal government with respect to local energy efficiency” pushed him to a no. President Obama has threatened to veto the Keystone XL Pipeline bill." However, a January Poll shows 62% of Voters Support building the Keystone XL pipeline (21% Oppose and 17% don't know) and 53% believe Obama should not veto the Keystone XL Pipeline bill (28% support veto and 20% don't know). The AP writes, ‘The evidence is in. The case ought to be closed,’ said Rep. Fred Upton, R-Mich., chairman of the House Energy and Commerce Committee. Sen. John Hoeven of North Dakota, the chief Republican sponsor of the bill, said in a statement ‘we will continue to press for approval by attaching an approval measure to another bill, perhaps an energy bill or must-pass appropriations legislation.’ Obama ‘needs to work with Congress in a bipartisan way and approve the Keystone XL pipeline project for the American people,’ he said. Senate Majority Leader Mitch McConnell said yesterday, “The Keystone Jobs bill is just common sense. That’s why this bipartisan legislation already passed the Senate with support from both parties. That’s why labor unions support it. That’s why the American people support it. “Americans know that construction of this infrastructure project would pump billions into the economy and support thousands of good jobs. They also know that America could achieve this with, as the President’s own State Department has indicated, minimal environmental impact. So Americans are urging President Obama not to interfere in the review process for political reasons any longer. Americans are urging the President to finally heed scientific conclusions his own State Department already reached. Let American workers build this infrastructure project, Mr. President. Sign this jobs and infrastructure bill. Tags: U.S. House, U.S. Senate, Keystone XL Pipeline, passed by Congress, President threatens veto, To share or post to your site, click on "Post Link". Please mention / link to the ARRA News Service. and "Like" Facebook Page - Thanks! The Los Angeles Times reports that all the applications expected for Obama's executive amnesty will be processed "at an office complex in suburban Washington, with a new staff of 1,000 government workers, supplemented by as many as 1,000 private contractors." The Washington Times adds that the U.S. Citizenship and Immigration Services Agency is planning to "operate two shifts from 6 a.m. to 11:30 p.m. every workday to keep up with the anticipated workload." The cost: nearly $500 million over three years, if government estimates are correct. A new report finds that the number of non-English speaking students in seven school districts in the metro Washington, D.C., area has increased 70% in ten years. Classes for these students "cost an average of about one quarter of each district's budget." The federal government helps with some of these expenses. But the report notes that "the costs of educating a student who is not proficient in English far exceeds the amount actually allocated." Where does the difference come from? Other programs get cut and your property taxes go up -- all because the federal government refuses to control the border. What about all those jobs that Americans won't do? Ask the 500 or so IT workers at Southern California Edison about that. They are being replaced by foreign workers with H1-B visas. I realize that there are legitimate labor shortages in certain industries, but those shortages can be handled with a good guest-worker program. But a new report from the Center for Immigration studies finds that: "In December 2014 there were 18 million immigrants (legal and illegal) living in the country who had arrived since January 2000. But job growth over this period was just 9.3 million -- half of new immigration." To put it another way, there were two immigrants (legal and illegal) competing for every one new job. What effect might that have on wages? And how compassionate is it to force unemployed or underemployed American citizens to compete in that kind of oversaturated labor market? Senate liberals are continuing to put their radical pro-amnesty agenda ahead of our homeland security interests. They are holding up funding for the Department of Homeland Security (DHS) because the House-passed bill defunds President Obama's unilateral attempt to rewrite our immigration laws. With funding set to run out in 16 days, Senate Republicans are getting nervous. 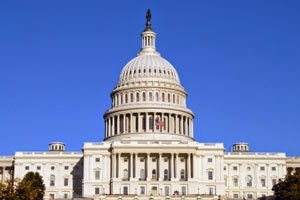 Newly elected Senators Cory Gardner (R-CO) and Shelley Moore Capito (R-WV) recently tried to urge their former House colleagues to start over after Senate Democrats filibustered the DHS appropriations bill three times last week. But Speaker John Boehner isn't budging. In response to a reporter's question this morning, Speaker Boehner said, "The House has done its job, why don't you go ask the Senate Democrats when they're going to get off their a** and do something other than to vote no?" I bet you won't see that forceful response on tonight's nightly news broadcasts! Tags: Gary Bauer, Campaign for Working Families, Illegal immigration, costing Americans, facebook link, Blogs for Borders Group To share or post to your site, click on "Post Link". Please mention / link to the ARRA News Service. and "Like" Facebook Page - Thanks!